Travel Diaries: Kangra Fort – Himachal! 29.12.2010 – The day was overcast and gray with splatter of raindrops now and then on the windscreen. 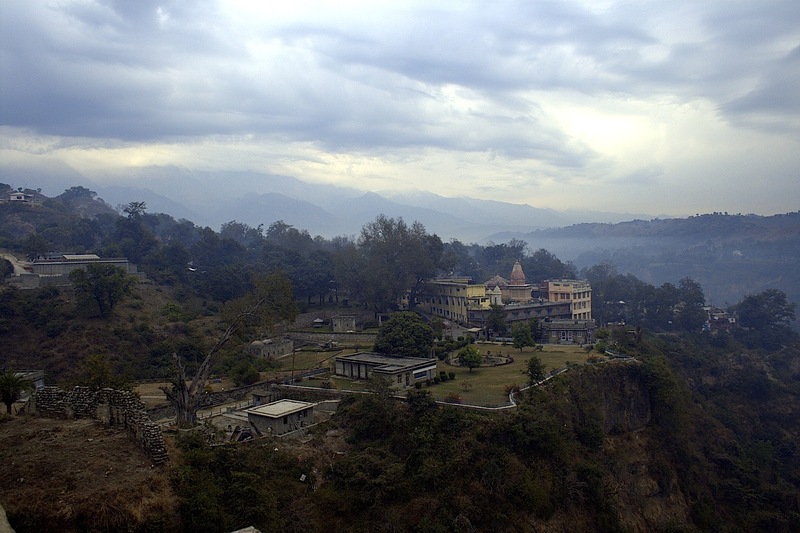 We drove about 20 kms from Dharamshala to reach Kangra town and headed up towards the Kangra fort which is also known as Nagarkot or Kotkangra. 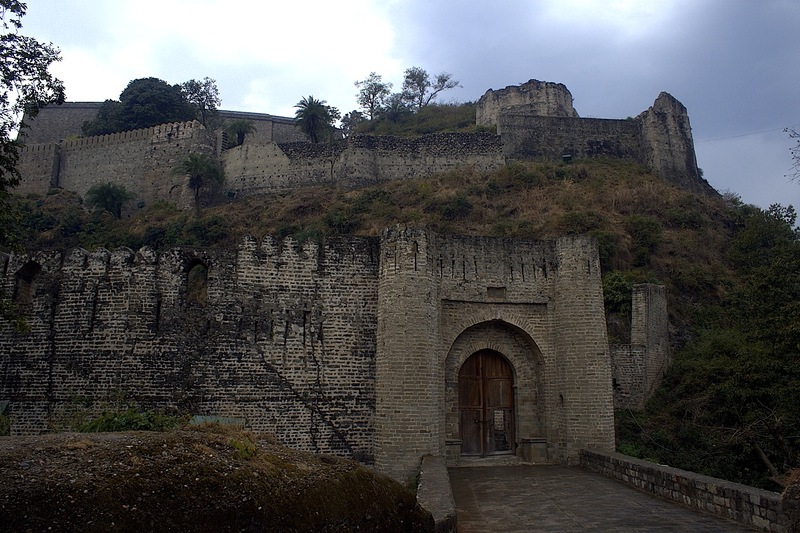 The kangra fort was built by the royal family of Kangra – the Katoch dynasty and was founded by Susharma Chand Katoch. 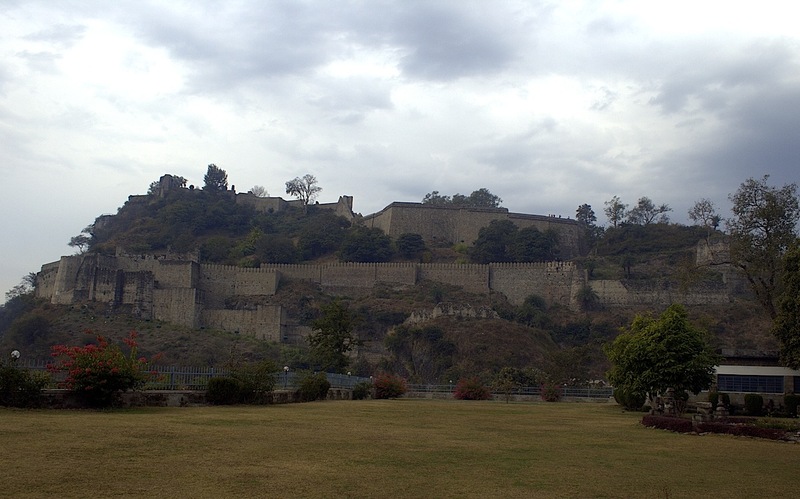 The fort dates back to 1009 A.D. and is probably the oldest dated fort in the Himalayas. It sits atop a hillside with steep drops down to the Banganga river valley, making it a formidable fort; difficult to climb and conquer. 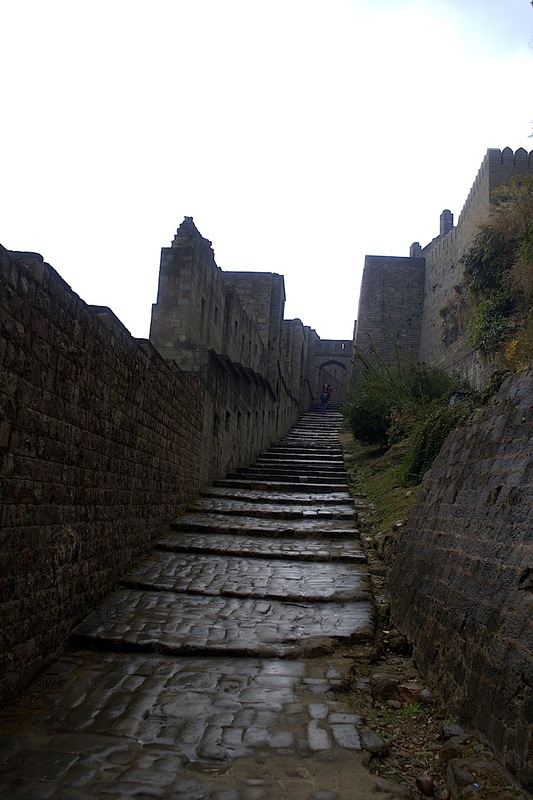 The high ramparts and walls cover a circuit of about 4 kilometers. We entered through the main gate or the Ranjit Singh Gate. 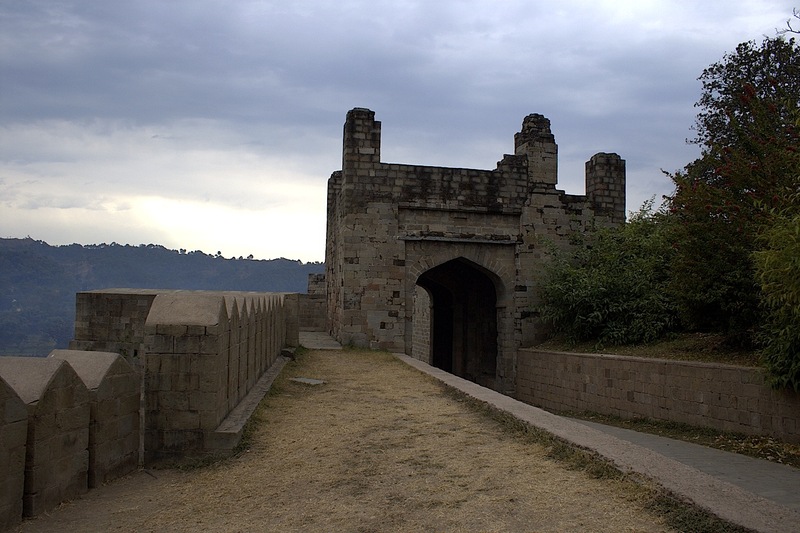 A long, narrow and slopping stepped passage leads to the top of the fort through the Ahani and the Amiri Darwaza– both attributed to Nawab Saif Ali Khan – the first Mughal governor of Kangra. We walked atop a wooden plank pathway to cross over to the Darsini darwaza, which is flanked by (now defaced) statues of river goddesses Yamuna and Ganga. The door-way lead us to a wide open courtyard where broken bits of stone architecture was arranged and numbered for easy identification. 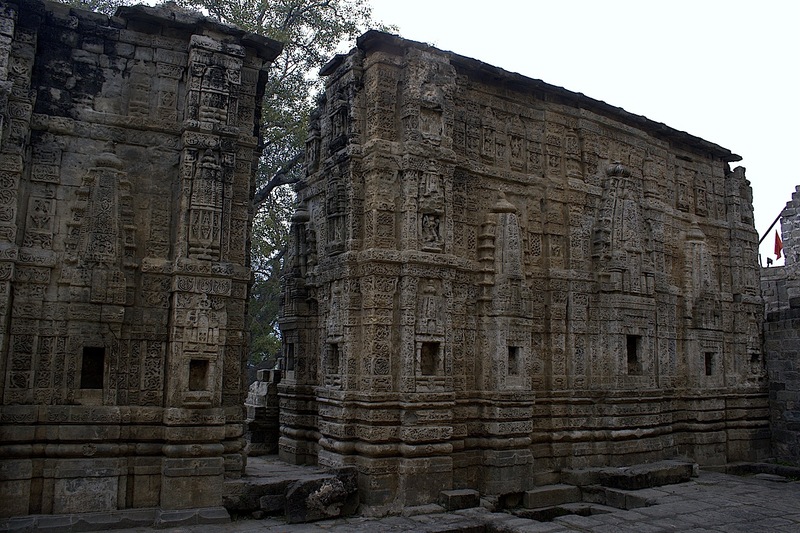 In the southern side of the courtyard, we could see some carved shrines – these were of Lakshmi -Narayana Sitala and Ambika devi – the family goddess of Katoch dynasty. In between these shrines, a small stepped passage leads up to the main palace. There are beautiful green spaces, spaced out intermittently to enable the palace residents to enjoy the gorgeous view all around. We could see ruins of chambers and even more steps lead us to the very top of the fort where are group of picnickers were laying out their picnic lunch. A sudden burst of raindrops made us all dash away to dry and sheltered area. We stayed put till the rain eased a bit and then headed down the fort over wet stones, which had turned slippery and difficult to tread. We were very impressed by the overall architecture and the expanse of this gorgeous piece of Indian history and architecture. There is a small museum at the entrance gate of the fort, set amidst a vast stretch of garden, overlooking the valley below. A small shop opposite to the main gate is the guide office for the fort from where one can rent out an audio guide, which catalogues in detail the numbered areas of the fort and tells its history in great detail. 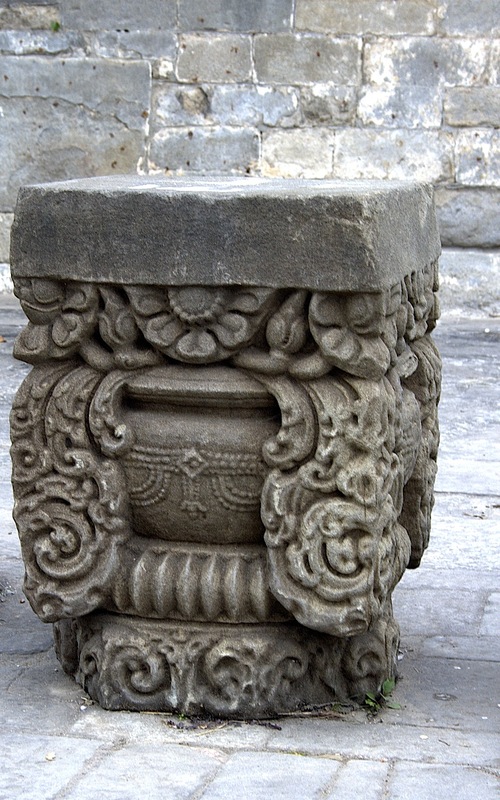 You have provided a very good information on Kangra Fort in Himachal Pradesh. Your blog is very informative for the tourists who are planing to go to Himachal. 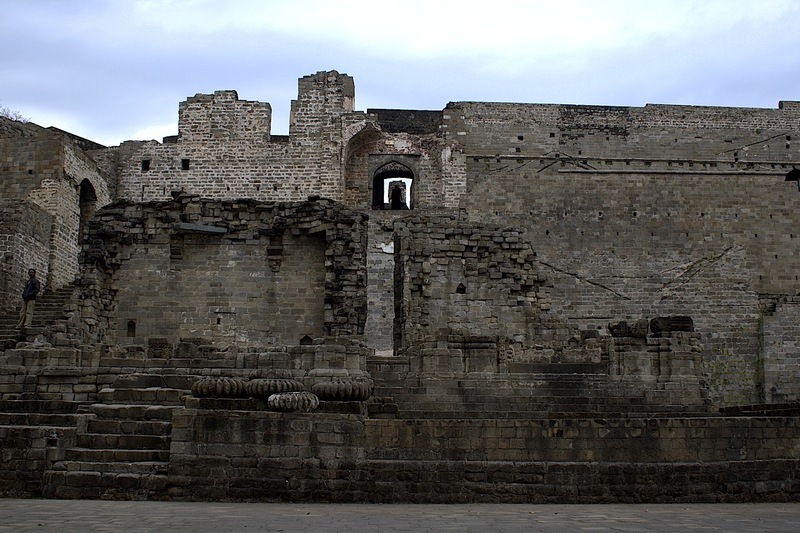 Kangra fort has good Historical story. Very well written and informative. Retweeted to our followers. Would love to share this on our blog as a guest article with your permission. Sure thing – please do link back to my blog and note that its not to be used or reproduced (especially) the pics in any other format. I am purely giving permission for one time share only!! many thanks for liking it and RTing it on twitter. I feel so good when people appreciate my writing!! Yes it breaks my heart too which is why I was stunned to see this so carefully preserved though its so unknown; I stumbled onto it and it wasnt on my planned itienary! Previous Post Macro mode: Flutterby!